Article first published as Diner Style Omelette on Blogcritics. When making a simple omelette, I tend to whisk some eggs with a touch of water or even cream. So when I first approach this recipe, I was surprised to see that the cream wasn't whisked with the eggs. Instead, they're folded in. Huh?! Yes - folded. The cream called for in the recipe is first whipped to soft peaks and then folded into whisked eggs. The result is a fluffy, airy batter that's cooked on the stovetop like a giant pancake. Cheese and your favorite filling ingredients are added on once the sides of the omelette is set and then it's off to bake in the oven for a few minutes. Once it's done, add the remaining cheese and filling then carefully fold over and slide onto your eager plate. The problem is, I tend to overfill my omelettes and so the folding part didn't quite happen. The omelette is huge as it is and so I just topped it with the rest of the ingredients and then cut it in half before serving... an open faced omelette if you will. :) However you prefer to serve it, it's one tasty omelette and is just as good, if not better than your local diner! Adjust oven rack to middle position and heat oven to 400 degrees. With electric mixer on medium-high speed, beat cream to soft peaks, about 2 minutes. Set whipped cream aside. Beat eggs and salt in clean bowl on high speed until frothy and eggs have tripled in size, about 2 minutes. Gently fold whipped cream into eggs. Melt butter in 10-inch ovensafe nonstick skillet over medium-low heat, swirling pan to completely coat bottom and sides with melted butter. Add egg mixture and cook until edges are nearly set, 2 to 3 minutes. Sprinkle with 1/4 cup cheese along with half of the filling ingredients (bell peppers, mushrooms and sausage) and transfer to oven. Bake until eggs are set and edges are beginning to brown, 6 to 8 minutes. Carefully remove pan from oven (handle will be very hot). Sprinkle with remaining cheese (and remaining filling, if using) and let sit, covered, until cheese begins to melt, about 1 minute. Tilt pan and, using rubber spatula, push half of omelet onto cutting board. Tilt skillet so that omelet folds over itself to form half-moon. 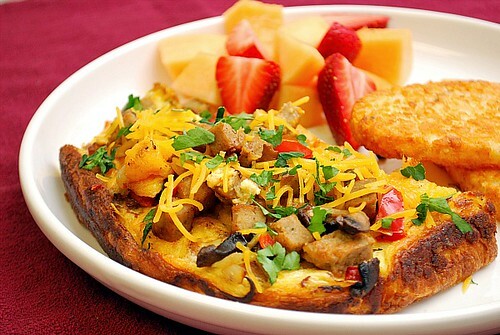 Cut omelet in half. Serve. I would never have thought of putting whipped cream in to eggs for an omelet, but it makes perfect sense! What a great idea.